WELL,I’M SARTEN I HAB’NT GOAT NAWTHEN……. 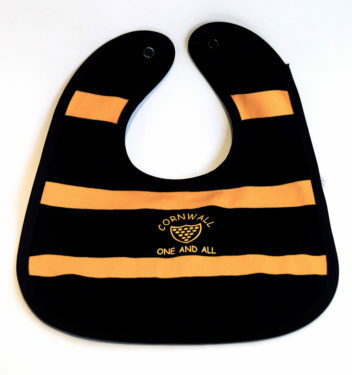 Keep Cornish Baby’s lovely clothes free from drips and spills with our generously sized Cornish colours Baby Bib. 100% cotton black and gold stripes,Ducal shield and “One and All” motto in the centre. Made in Cornwall. Overall length 35cm.